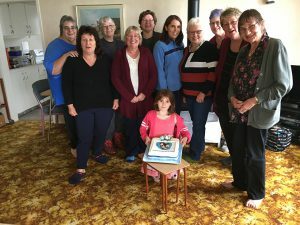 Holy Family Whanganui Marian Mothers’ group gathered for the weekend of 19‒20 in May to celebrate the group’s 30-year anniversary. From a beach house at Mowhanau Beach, north of Whanganui, they walked along the coastline, read, prayed, shared, recited the rosary, then returned to Whanganui for Saturday Vigil Mass and some watched the Royal Wedding on TV. It was reminiscent of weekend retreats at Futuna in Wellington and Magnificat Centre in Southern Wairarapa. Sr Theresa Devon rsj spoke about introducing Marian Mothers and ‘the rest became history’. Raewyn Hoskins became the coordinator. Meetings continue to be held at her home. Fr John Allardyce sm, who was national chaplain, prepared the monthly themes and recorded tapes with reflective questions forming the basis of the gatherings. The group filled a supporting and spiritual need and for many mothers, and the only time to be away from their children. ‘Mothers have come and gone to the group through the years but the core has remained and the group still meets a need,’ says Raewyn.